This interesting name is found recorded under the spellings of Harvet, Harvatt, Harvett and Horvath and it is the latter spelling which provides the clue to the origin. The name is a Hungarian descriptive national identity for a "Croatian" in the same way that "Galle" is the French for a Welshman or Celt. The name derives from the Slavonic "hrvat" from the pre 7th Century A.D., the most usual spelling on the continent being "Horvath". The name development in England includes Joan Harvett who married Edward Griffin at St. Giles Cripplegate, London in 1799 and John Harvatt who earlier married Catherine Tarrant at St. Anns, Soho, London in 1761. 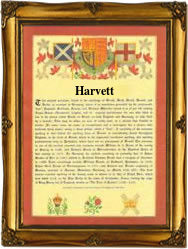 The first recorded spelling of the family name is shown to be that of Daniel Harvet. which was dated 1730, baptised at St. Olave, Southwark. during the reign of King George 11, known as the Last Warrior King, 1727 - 1760. Surnames became necessary when governments introduced personal taxation. In England this was known as Poll Tax. Throughout the centuries, surnames in every country have continued to "develop" often leading to astonishing variants of the original spelling.